I was flipping through the For Sale ads of a local paper when I spied a tiny advertisement for “Jute Boxes.” Could they mean “Jukeboxes?” I dialled the number with an expectation of disappointment. “Hello,” an elderly voice answered. “Look,” he continued, “if you really want to come you can look at them as long as you don’t try to buy any of them.” This guy really needed to work on his sales pitch. His house was what can only be described as a jukebox museum. Every room had at least two jukeboxes in it. The living room was home to a ’70s-era flat tabletop model and another that looked like a cross between a robot and a trash can. His tiny kitchen boasted an art-deco model from the 1920s that played 78s and a beautiful bubbling Wurlitzer that was in an eternal fight with the refrigerator for space. His bedroom had three different machines, all plugged in with fluorescent tubes buzzing. They were wedged in-between the bed and a dresser as if it were a jukebox showroom that was temporarily housing some bedroom furniture and not the other way around. 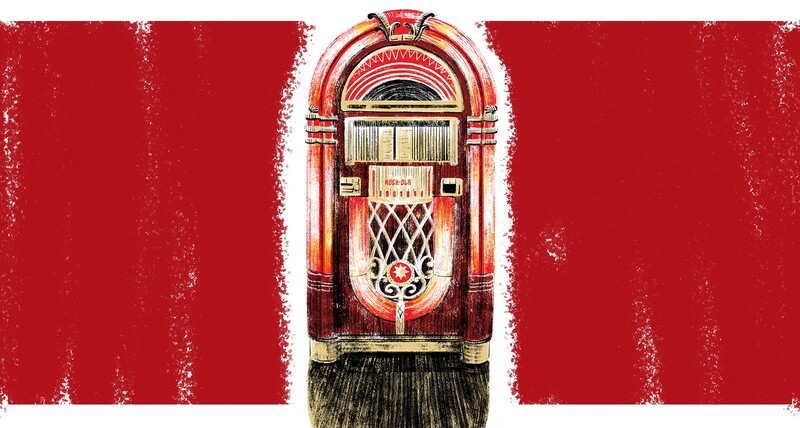 His love of jukeboxes was not shared by his wife and now, settling in to retirement, she was pressuring him to sell them off so they could downsize. The more we spoke, the more he could see that I was a like-minded soul. For my entire life I have been in love with the music of another time. I’m 44 but I much preferred the pumping piano of a Little Richard or a Jerry Lee Lewis to any of the synth sounds of my teenage years. I’d rather listen to the joyful wail of Little Stevie Wonder than the processed croon of the grownup version just calling to tell me he loved me. I settled on a 1956 Rock-o-la. It has a visible record rack that whirrs and spins when you select one of the 60 45s. Choosing what records to play on your jukebox is a very personal decision. I’m blessed with the opportunity to travel for work. Most new towns I visit have a record store and I disappear into the boxes of 45s like Indiana Jones descending into an Egyptian tomb. It’s not just the records you find. It’s also the odd characters you meet while looking. My hunt for the perfect playlist brought me to Stryder Records in Greenwich Village where I met its owner, Bob. He used to sell John Belushi the blues records that fueled the Blues Brothers on an NBC tab. He told me of the time Johnny Cash walked in looking to replace his collection of his own music after a house fire melted his archive. “You didn’t charge him, did you?” I asked. “Yeah,” Bob answered, having to think on it. “But I gave him a good price.” Bob’s store isn’t there anymore but I think of him every time I play “I Walk the Line.” I can tell you where every record I have was purchased or who gave it to me. When people come to visit, they immediately gravitate toward the glowing chrome box in the corner. Their eyes widen as they hear the “thunk” of a quarter disappearing into the coin slot. They carefully select the three songs that their twenty- five cents buys them. They stand in silent wonderment as the mechanical arm slowly reaches back to pull the record from its slot. “Because,” I answered, “in 60 years, nobody is going to be standing around at a party in front of an iPod arguing about what song to play next.” Music is meant to bring people together. The perfect playlist should be earned, not downloaded. Keep your ear buds. All I need is a quarter. MARK CRITCH IS A COMEDIAN AND STAR OF THIS HOUR HAS 22 MINUTES. HIS NEW MEMOIR,SON OF A CRITCH, IS OUT THIS MONTH.